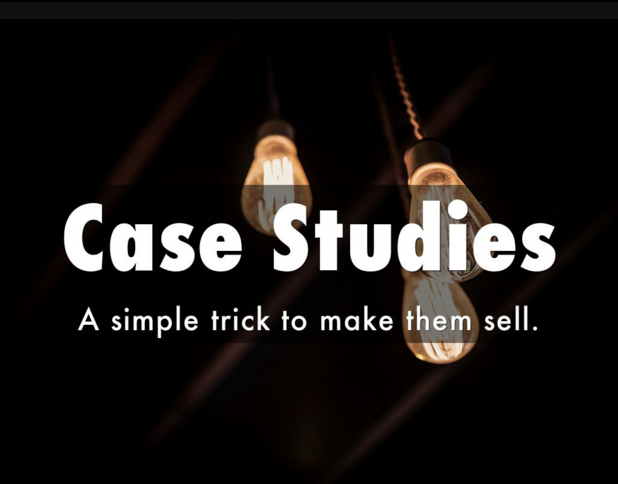 Here’s a simple way to turn boring case studies into something your market will actually care about. Instead of asking leading questions – absolutes – that result in boring, canned, you-centric answers… For example: Why did you start looking for a new widget? Use Alex Blumberg’s (Award-winning host of This American Life) favorite phrase: Tell me about the time…. Instead of getting a canned response what you’ll get is a story. Emotion. The guts of the thing. And the story – with your customer as the hero at the center – is what people actually care about. The results, yes. But without the how – the story and proof of how the results came about – the results don’t feel real. It’s just another empty promise. You’re a skeptic. I’m a skeptic. Everyone’s a skeptic. Simply saying you achieved some result doesn’t make it true. It doesn’t make it feel real. It doesn’t make someone care. The story is what turns skeptics into believers. The story of the how. The results – yes – they’re there. They’re the punchline. But the how is the meat. Google the word “dogs.” Just under the search bar, Google will brag it just found 783,000,000 results in 0.37 seconds. This is a case study. It’s a result – a reason you should use them. Now think about that result for a second, the immensity of that accomplishment. The entirety of human knowledge about dogs at your fingertips in milliseconds. No one cares. It’s not impressive. We don’t even think about it. BUT – talk about the algorithm. Tell me about the scientific breakthroughs that deliver that result. The satellites. The personalities. The struggles of the scientists. I’m fascinated. The existence of the Discovery Channel proves this is true. The how – the story behind the outcome – is what people care about. Probe. Dig. You’re Charlie Rose. You’re Oprah. You want your customer to start crying thinking about all the struggles they overcame and how good things are today. Be authentic. Don’t sanitize it. Get the emotional connection – the how – the story. If you’re actually interested while the interview is happening – everyone else will care about the story you have to tell. P.S. Want more of Alex’s tips? Take his class Power Your Podcast with Storytelling. Great insights whether your blogging, podcasting, or just trying to tell better stories. Want more B2B marketing tips direct to your inbox? Subscribe to the Market of One Report. Walter O’Brian (AKA Scorpion) is a genius – in every practical sense of the word. Without going through all his credentials – he has an IQ of 197 and runs a “think tank for hire” that currently does around $1.3 billion a year. So he’s a pretty impressive guy. So in his younger years this gentleman was a competitor at the the Olympics in Informatics. From what I can gather it’s essentially the coding Olympics. And during the interview he told a story that resonated with me, and I thought I would share it with you. When amateurs receive the problems to solve, they will start banging out code on the keyboards right away. The professionals, on the other hand, will sit there, almost in a meditative state, for up to 30 of the 40 minutes allotted, trying to understand the problem. Trying to figure out how they would solve it. Choosing the right programming language. Writing the code in their head. Dry reading it in their head to make sure it works. Then the last ten minutes they type out that solution as fast as they can. They worked to understand the real problem they were trying to solve (it’s not always the one on the surface). They worked to define a plan of attack. The identified the best tools for the job – the right language. They worked through scenarios, consequences, and alternatives with the end goal in mind. Then, and only then, did they get started with the making. This is what led to superior results. Before executing on anything – they made a plan. In marketing, as in all of life, our first tendency is often to just start running – trying to solve problems we don’t even truly understand. The lesson of Scorpion is clear: If we want to be professionals, we need to stop, clearly understand the problem we’re trying to solve (because every action is aimed at solving some problem), and make a plan first. Any other approach – and we’re stuck in amateurville. I was worried we wouldn’t get noticed by the right people. Worried I wouldn’t meet my quarterly goals. Worried I would miss some part of the market. Worried I wouldn’t take action and the right opportunities would pass me by. Worried my boss would think I wasn’t doing enough. But I had ideas. All sorts of ideas. We should do this! And that! And reach ‘em here! And we can’t miss anything! And wait, those people could use our products too! And so I started running. Running to do everything. Publish blogs, whitepapers, trade shows, press releases. Emails – more emails! Buy data! PR! And in the end, I missed everyone. Looking back, I now know these were just anxiety activities. When I wasn’t sure exactly what to, I tried to run faster, do more, and cross my fingers that something would get traction. No plan, no clear goal – lots of good intentions – and an endless treadmill on which to run. As it turns out, more is almost never the answer. Instead, the answer is nearly always to do less –but do those few things insanely well. The answer, if you feel yourself trapped on a similar treadmill of your own design, is to stop running. Instead, slow down so you can later speed up. Stop and figure out what is truly unique about your organization, what the result is you can help others achieve that no one else can. Then, the answer is to build ownership of these ideas through a platform. One core hub where you provide value and demonstrate the unique results only you can deliver. The answer is to make a plan. Figure out how to till a field and methodically plant seeds – instead of scattering them into the wind. Take Hubspot. This a company that carved out their position as one apart from the masses based on ownership of a single word – inbound. They built a platform to bring to this idea to the world, attracted more than 300,000 subscribers – and as of 2015 they have a valuation of more than $1B. In today’s world where there are a million potential ways to reach people, and a million potential buyers and industries and opportunities – the ones who break through and get traction are those are those with intense focus. They work to earn attention and build trust – in one core hub first. They provide a certain kind of value – provide answers others can’t – and have a place where people consistently and reliably come to get that value. And the best part is that within each of us – every person, everyorganization – there is a unique result and DNA which can be leveraged to set you apart. And a way to focus your efforts so that you no longer resort to running harder and faster and instead get more results by doing less. Do this and soon you’ll be looking out over your own field, the seeds you’ve sewn today ready to harvest. 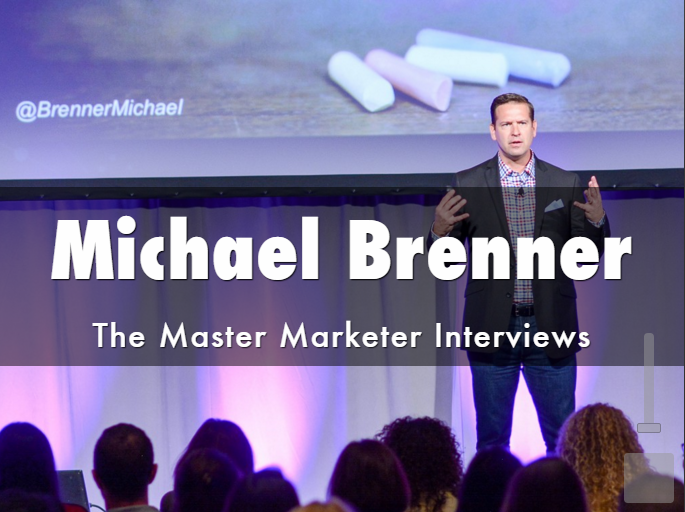 Last week I had the pleasure of speaking with Michael Brenner, one of our industry’s most accomplished marketers, speakers, authors, strategists and executives – as well as an extremely nice guy. Before making the jump to helm his own agency – Marketing Insider Group – Michael was Head of Strategy for top content platform NewsCred, VP of Marketing and Content Strategy at SAP, and on and on. He publishes one of the top B2B marketing blogs here, co-authored the great book, The Content Formula – among many other accomplishments. Q: For a small organization with a limited budget, is content the best place to invest? Or is there another activity that you’ve found more impactful? Michael Brenner (MB): I think content is the only place a small company should be investing. For one simple reason. Otherwise, what are you left with what… PR? 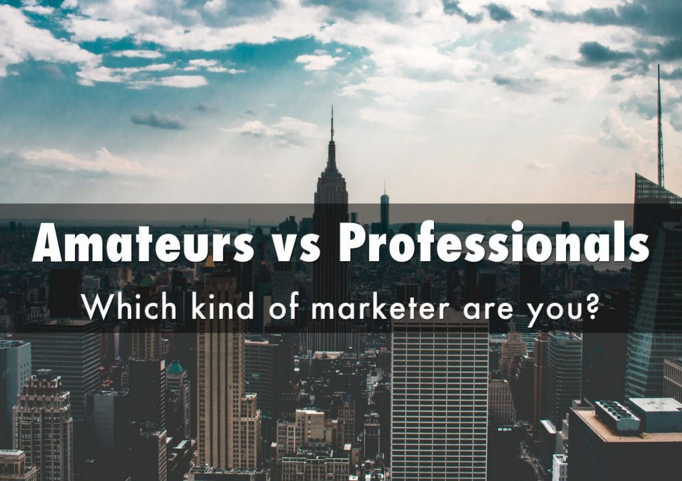 What this comes down to is the definition of content marketing – and a lot of people, and this always surprises me, still don’t truly understand the definition: turning the expertise you have as a company or as an individual and demonstrating that expertise to your customer. Becoming the hub for answers and the place they turn when they have questions. What company in the world wouldn’t want this? Q: One of the challenges I frequently see folks struggle with is a lack of focus. 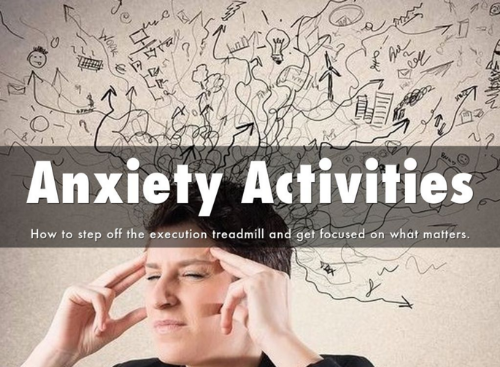 They’re trying to do 20 different things and as a result get very little traction with any one activity. For someone who has a small budget and limited resources, what’s the one activity you would advise them to focus on? MB: For me, the answer to this question is in the definition of content marketing. But still today, as you point out, many people truly don’t understand what content marketing truly means. It has to be in a hub. This is the difference between content and content marketing. So the answer to the question is to start blogging, or creating some type of venue where your prospects and customers can subscribe and follow you on a regular basis. For example, I do pro-bono consulting for a number of non-profits. I’ve seen small organizations drive exponential lift in results just by telling their story a company blog. The trick for a very small company, even say, a 5 person company, is to mine your salespeople and customer support staff for insights. Every employee provides answers to customer questions via email. Every salespeople understands common questions or FAQs. You can develop a years worth of content just from mining that treasure trove. Q: Most people do this the opposite way, they start with gated content. What role should gated content play in content marketing? MB: I would never say to stop creating gated content. Gated content is important in the middle of the funnel. But for most marketers, the problem is they can’t find enough people that are interested in that middle of funnel content. The key is to drive that interest at the top-of-the-funnel. So once you offer gated content, you’re delivering it to an already engaged audience and providing deeper value. If you think about a relationship, the gated asset is like delivering the ring. You’ve been talking for a while, now it’s time to take things to the next level. But you don’t just offer the ring cold. Q: In your book, The Content Formula, you mention one of the defining characteristics of content marketing is that it isn’t campaign based. Understanding that, how do you structure content? Do you recommend specific themes or “pushes”? Do you like the traditional magazine editorial structure? MB: A magazine is a great example of how to structure content. For example, Sports Illustrated does a swimsuit issue in the dead of winter when people want to be on a warm sunny beach. Forbes does it’s “richest people” list at a certain time of year. Themes can be organized in any way you like, but two of the ways I recommend are event/trigger driven or a rolling approach. For example, publishers – brand or media – they define a series of categories that define the things they want to be experts at. They publish on a regular basis on all those categories. For example, go look at RedBulletin. Focus changes throughout the year. In the business realm, there are some exceptions though. I had a client in the financial services sector that was targeting origination of student loans. There is absolute seasonality to loans – 80% are secured in a certain 3 months of the year. They do a “campaign” with a big media push around that time of the year. I would never tell them to stop this. But what I did say is that, the more we’re in front of parents and students the other 9 months of the year, the more likely you are to be the one they go within in that key period. Q: What are the keys to creating compelling content? MB: Here are two things someone can do. I always want to be the best answer on the internet, whenever I can be. Another way to drive engagement is to say something controversial. For instance – “why corporate websites are dead” or “why you should stop promoting in your content marketing.” When you truly believe it, it is authentic. Sometimes it pays to take a stand. Here are another couple ways – be the first to present something really visually. Use great multimedia along with text. Q: What’s one piece of advice you would give someone to accelerate audience building? MB: This one is a bit controversial and I actually have fights with people on stage about this – but to me the answer to this is volume. Publish a lot. For example, Hubpsot look at 4,000 websites and found that when you move from once a month, to once a week, to once a day, conversions rose exponentially. The assumption made is that these are average quality articles – and they are simply publishing more. Do this, and you’ll see more reach, engagement and conversation. The research shows no diminishing return. We live in a world where there is no loyalty. So if you are producing content more frequently, then you’re a lightbulb that is blinking more often. Q: If the content is low quality, is there a potential to damage your brand? MB: Think about it this way. Think about the amount of time most brands spend crafting their home page content. Now, for the average website, only about 10% to 20% of traffic is going to the home page, 80% to 90% is just visiting the article. So that means 8 or 9 out of 10 visitors is just concerned about your article. Think about all that time spent on the home page content, and what the true impact is. Now, to take it a step further. When you look at an article page – 90% of people only ready 20% of the content – just the headline and first two paragraphs. Maybe they will scan for bullet points within. The implication of all this is simple: You need to define what is “good enough” and work on driving volume at that good enough level. We overestimate the value of perfection. As well as the price of perfection. Yes, if what you’re providing is total crap, you might be ruining, rather than building, your brand. There are times when I read a blog or article I wrote six months ago, and see a spelling mistake, and usually I just leave it there. Sometimes faster is better. I’m actually one of the worst editors of any of the prolific blogers in the world, and I think that’s OK. It lets my humanity show through. Q: If someone hasn’t yet gotten traction with content marketing, or isn’t getting the results they hoped for, what is the one metric they should focus on improving? MB: Subscribers. It gives you a view into the size of audience, level of engagement, and then conversions. In this one metric, you’ll get a snapshot into your entire funnel. A content subscriber is someone ideally in your target audience, who is now engaged. There’s an absolute correlation between brands that build a subscriber base, and their success in content marketing. Subscribers, and tracking subscribers, it is the key to content marketing success. Companies that don’t focus on this struggle. Companies that do this well, succeed. Q: What’s an example of a company marketers should look to emulate? But if I had to choose one, it’s a blog called VanWinkles. This is a blog created by a company called Casper. Casper is an online mattress company which builds the most comfortable mattresses you’ll ever sleep on. I’m a customer and I love these things. They’re trying to disrupt the whole process – from bad mattresses to pushy salespeople, etc. I’m also seeing this catch on with other great examples including HP with TechBeacon and Cisco with ConnectedFuture’s. Q: What’s your top 1 go-to information source for marketing? MB: If I have to choose one, I would say Content Marketing Institute (CMI). But really I would look to three: CMI, MarketingProfs and Hubspot. Each take a different approach, and if you look at all the information they publish, you’ll really become an expert marketer. Q: If you could only go to one marketing event every year, what would it be? MB: Ohh, you’re killing me. Honestly, for me it’s gotta be two. Content Marketing Institute’s Content Marketing World and MarketingProf’s B2B Marketing Forum. Joe Pulizzi’s “Content Inc.” It’s a must-read for every company, every business, every entrepreneur. Want more of Michael’s wisdom? Here’s where you get it. Want more interviews with top marketers? Subscribe to the Market of One Letter. How can you tell a story that will move your market? Decision makers. Influencers. Approvers. What story can you tell that will unite them in purpose and transform institutional inertia into action. How can you tell a story that will resonate in a way that is authentic and meaningful. That strikes nerves, avoids platitudes and familiar promises, and hits home in a way that has sincere resonance. A story that has mileage – and thrives over the long-term. Across channels, across audiences and across mediums. Catalyzing change and positioning your company as a Market of One. Here is the step six process that I use to find answers to these questions. Done correctly, this process will help you unlock you markets greatest pains, and discover how your organization is uniquely positioned to be the salve. Here’s a brief overview of the 6 steps I follow to create assets that survive and thrive over the long-term. But remember, the steps are the foundation – navigating them thoroughly and with care are what will lead you to your impactful story. Taking the time to intimately understand the market is one of the key steps that will separate your story from competitors. During this phase, consume all the information you can find to inform your messaging – especially resources which will give you a unique perspective from within your organization – such as research, internal experts, etc. The key is to find insights which are not readily available in the market which you can harness to inform your positioning as well as conten. Finding the right story is the difference between an asset that gathers dust, and an asset that inspires changes. An asset that survives and thrives across mediums and over the long term, rather than silently entering the market and being ignored. During this stage, review your markets key pain points as well as your company’s Singular Resonance and Lynchpins. Marrying these with your markets pains, and telling the story in a way that feels personally resonate, will set you apart. Today’s buyer is an omnichannel buyer. They drift between screens throughout their day. Knowing this, you must craft a story that is engaging and accessible across mediums. During this stage explore potential options for unique and engaging ways to tell your story in an onmichannel world. How can your story be ubiquitous? Laying a strong foundation will ensure you build an asset that is powerful, authentic and congruent with everyones vision. During this stage build an outline of your asset and its key points, taking care to organize your content in a way that is easy to understand at a glance, yet feels comprehensive and true in a way which is indisputable. Only now do you get started creating your asset. Crafting the words and images. Skipping the first steps is why most content looks and feels the same – and most stagnates – attracting few leads or making any real impact. Content is most powerful when it prioritizes substance over length. Yet because of the rush to simply “get something out the door” we often forget to spend the time to hone our messages down to their essence. During this stage, work to distill your story down to ensure it includes only the critical. This needn’t take weeks or months – often simply putting the content away for a day or two and coming back to it again will be the difference between creating something impactful – and something forgettable. If you need a little help finding your story – you can always get in touch here. Like this post? Subscribe to the Market of One Letter so you don’t miss a thing.